b small publishing is a London-based publisher specializing in creative and educational non-fiction and language learning for kids. Their books always draw me in with their bright, happy covers. It looks like the content is going to be fun! Previously I reviewed b small’s Hide and Speak and Family Tree series. 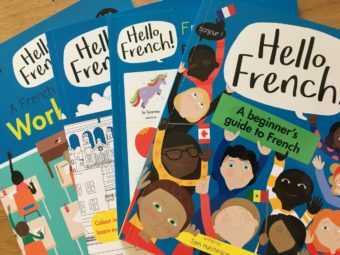 This time I’m going to look at “Hello Languages!” a new series of four books for young language learners from the age of six. The series consists of the basic Beginner’s Guide, Workbook, Colouring Book and Picture Dictionary. They’ve just been published (November 2018) and are available in English, English-French and English-Spanish editions. The publishers have kindly sent me the French series to review on my blog. This “core” book for the series has a lively, bold cover. The “blurb” on the back emphasizes the importance of confidence and enthusiasm in building a lifelong passion for French. On the inside front cover there’s a “How to Use” section which is clear and easy to read. After that, there’s something new and refreshing. It’s a section called “Les droits des apprenants d’une langue” – The rights of language learners. These include the right to ask someone to repeat, the right to have a go and to make a mistake – very reassuring. There’s no need to be afraid of “getting it wrong”. However, with very young language learners it’s sometimes best not to even mention that mistakes can be made! 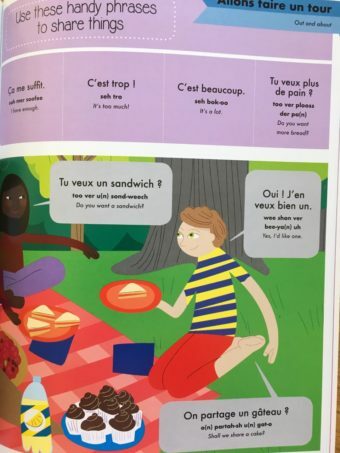 After this section, the others cover all aspects of everyday life and give the kids basic French skills to build on as they grow. The images are lovely and include kids of varied ethnicity as well as wheelchair users. We’re shown how to pronounce the words as accurately as possible using English sounds, eg. ler meer-war = le miroir. 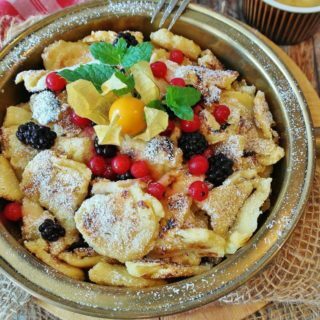 Even so, it would be best to have a native speaker read the words with you to get the most authentic accent. 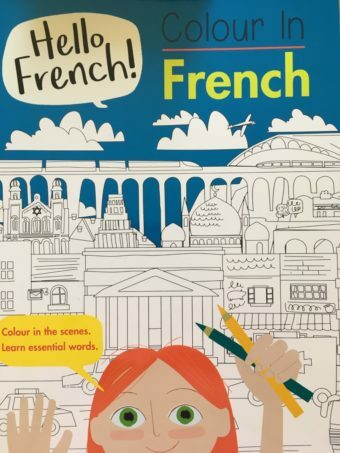 By the time you get to the end of the book you’ll have been exposed to/learned about 500 French words, and lots of handy phrases along the way. 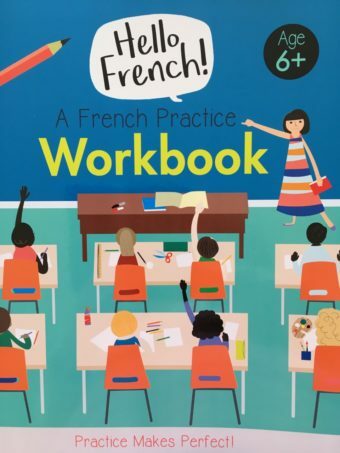 You’ll have the satisfaction of seeing lists of the words you’ve learned in the French-English and English-French word lists at the back of the book. This shiny activity book gives you the chance to reinforce what you’ve learned by writing in the boxes and completing the sentences with information about your own life. The visuals in this book are just as delightful as in the Beginner’s Guide, and the pages are not too “busy”. 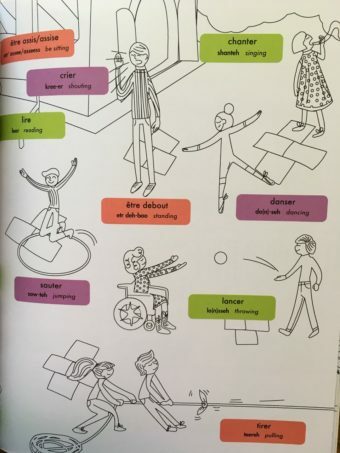 The illustrations stand out and the blank spaces are just asking to be filled in by the young writer/linguist. My daughter commented: “Very handy tracker, and nice presentation. Could it include stickers as “rewards” for completing a page, instead of marks?” Well, I suppose you could provide the stickers yourself, there are lots to choose from in the shops. 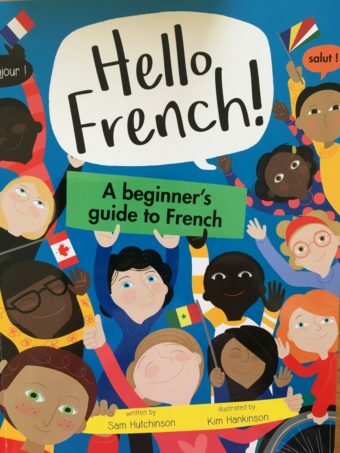 By the time you’ve finished this book you’ll have recorded a lot of useful phrases about yourself and your family in French. 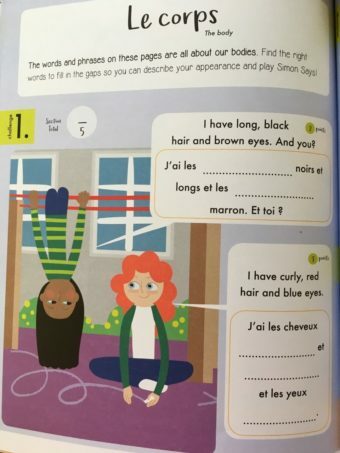 Your own personal book in French! The kids will be excited at creating their own images while consolidating the words, and colouring-in is very soothing for all ages, adults as well as kids. The scenes in this book are taken from the Beginner’s Guide. The words are organized into popular themes and the images are simple and colourful, standing out against a white background. More than 350 French words are listed. 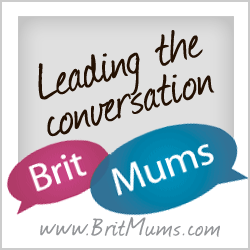 “…Kids like cool facts and fun things to do. That’s why language learning books for kids should be bright, bold, fun and colourful. 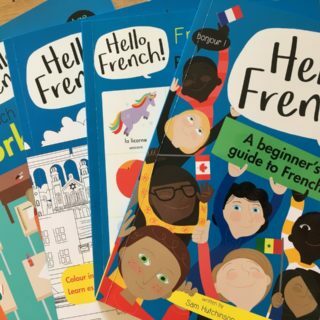 They should be filled with practical examples of language in everyday life and encourage kids to just have a go without fear of making mistakes”. Well, these books do all those things. 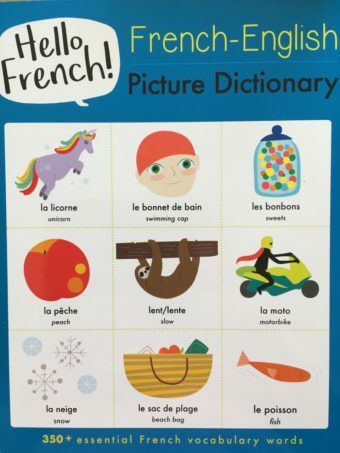 Have fun playing and learning French with your child! Thank you to b small publishing for sending me the above books to review. As ever, I’ve given my own honest opinions. If you’d like to find out more about b small publishing please visit www.bsmall.co.uk. 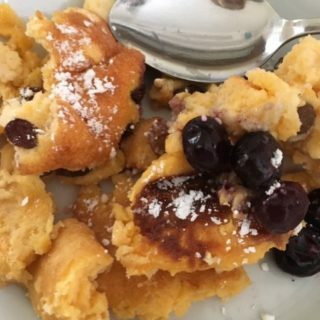 « Es zieht! There’s a draught.